By following a particular brand or vendor as when using the 'discover' feature, a request will be sent to them automatically on your behalf. This request simply states that your store/company is requesting access to any product or training content that they currently have on the Myagi platform. The requested brand or vendor has the option to deny or accept your request. An accepted request will then be defined as a connection. 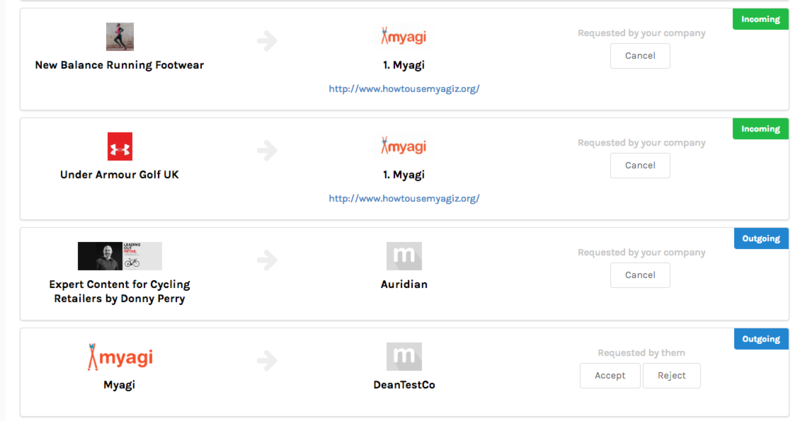 This connection means that your companies Myagi administrator can now assign the newly available content in test plans. You can easily see what requests you've made by visiting the Channels screen then clicking on the 'Requests' tab. These cards will display the two companies involved. The requester and requested. Any request that you have made will be tagged as outgoing. If you see cards tagged as 'incoming' this means that someone is requesting access to your channels and content.